White drupelet is a tan-to-white discoloration of one to many drupelets on the fruit. Most often, white drupelets will appear when there has been an abrupt increase in temperature accompanied by a drop in humidity; it is especially pronounced when there is wind. In the Monterey Bay area, white drupelet typically occurs when temperatures that are fairly steady around 70°F suddenly go above 90°F, and there is an absence of fog. While white drupelets may seem to be directly caused by weather, they are actually caused by ultra-violet (UV) radiation. Weather conditions modulate this by the effect they have on penetration of UV radiation into the fruit. Cool, humid air scatters and absorbs UV radiation, while hot dry air has the opposite effect and allows more direct UV rays to reach the fruit. The movement of humidity away from the canopy by wind only heightens the effect of hot dry air. Additionally, as humidity is moved away from the plant canopy, more UV rays penetrate the canopy and damage fruit that may not even have been exposed to the sun. Fruit inside of the canopy is not acclimatized to UV radiation and is subsequently more susceptible when it reaches them. Some growers of caneberries in the Willamette Valley of Oregon, where rapid changes from a normally mild climate to temperatures up to and above 100°F occur through the summer, use overhead irrigation to minimize fruit loss to white drupelet. This is not merely to mist the fruit; instead, large amounts of water are applied to thoroughly wet the canopy and maintain cool temperatures and high canopy humidity for as long as possible. Sprinkling is not done too late in the evening to allow fruit to dry before nightfall. 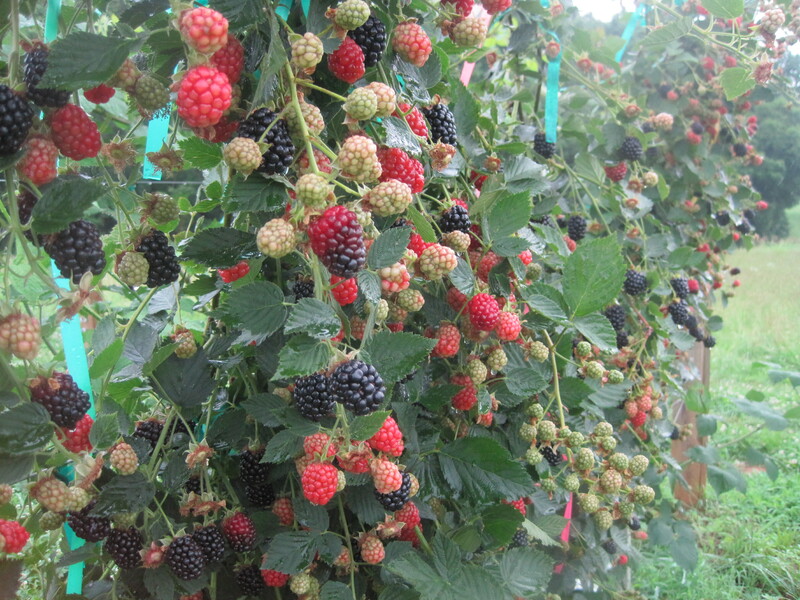 While some varieties, such as Apache blackberry, Kiowa blackberry, and Caroline red raspberry tend to get white drupelets more frequently than others, almost all caneberry varieties are susceptible to white drupelet to some degree. Tolerance for white drupelet varies to some extent by grower. Growers that ship berries have no tolerance, while pick-your-own growers can tolerate a few white drupelets (see last point, educate your clientele). White drupelet disorder is usually a problem early in the season and then disappears. • Love Blackberries? Why Not Grow Your Own!